1. To explore the possibility of a neighbourhood council for the Grove ward in the belief that such a council is both the most democratic and also the most effective community structure for radical action in an inner city area. 2. To organise a project centre which can be used by local residents for the purpose of achieving maximum take-up of welfare benefits, the exercise of their social rights, and to enable them to define their needs in respect of housing, environment, education, employment, and community activity. The City Poverty Committee is a nationwide charitable organisation participated in by scholars and politicians including Members of Parliament. Although it is not a religious organisation, the Rev. David Mason, who was a Methodist minister in Hammersmith at that time, was appointed Director to the Hammersmith Community Development Project. 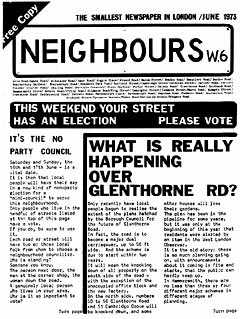 Based on the idea that poverty and deprivation can only be solved with the active participation of the citizens themselves, a Neighbourhood Council was established in the 1960s in a corner of Notting Hill, an area notorious for race riots due to the widening gap between rich and poor. 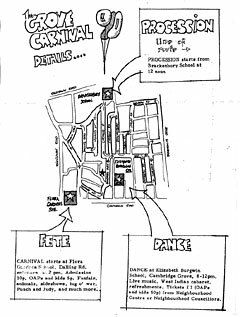 The Committee undertook a series of community developments such as planning and holding a carnival. It was this Committee for City Poverty which was responsible for the experiment called the Hammersmith Development Project in the 1970s. However, why was the Grove chosen for the project amongst a number of London�fs �gtwilight areas�h? An additional consideration was that there was no existing community work in Grove Ward and that therefore the Project would not pose a threat to any ongoing group, nor would it be duplicating work already begun by other organisations. The Grove Ward was virgin soil and, in many ways, this made it an ideal neighbourhood in which to begin work, since there was no history of past mistakes and abortive initiatives to overcome. The Project selected Grove because it was a typical English urban poverty area where there was still plenty of scope for solving problems in terms of attempting urban community development. How did the Grove residents respond to such development project activities from outside areas? �gThe First Report 1972-73,�h details the establishment of the Neighbourhood Council (pp. 4-6). While discussion with the Hammersmith Borough proceeded, the Hammersmith Community Development Project began its activities in the Grove Ward in September 1972. They researched the actual situation in the ward with social-workers sent from Hammersmith. Meanwhile they also created a network of local co-operators with an introduction from the Borough Councillors; and they held a public meeting every month. In January, 1973, a preliminary project team to promote the Hammersmith Project was established and this group had neither Borough Councillors nor London Assembly Committee Members. They had resolved that the first Public Meeting was to be held on the 23rd of January and the first election of the Neighbourhood Councillors in the third weekend of June, 1973. 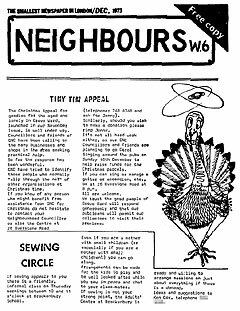 They also decided to produce a community newspaper with the help of six volunteers who were residents of the Grove Ward. 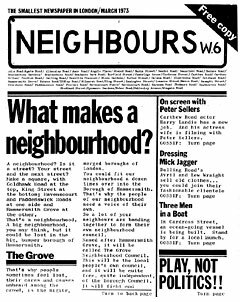 The newspaper was titled �gNeighbours, W 6�h and it claimed to be �gthe smallest newspaper in London�h. Three thousand free copies were distributed once a month to all households in the Grove Ward. Its contents were about local news as well as the need for a Neighbourhood Council. It served as an information source to convince residents of the necessity of establishing a local council to reflect their own opinion. Meanwhile the Project Team was producing a Council Constitution. In March, just before the Council was formed, they had opened the Neighbourhood Centre with the help of the Notting Hill Housing Trust3 which granted the use of an old house in the Ward free of charge. What we needed to define was the role of the Hammersmith Community Development Project since the Grove Neighbourhood Council had been elected. It was important that the newly elected council should be autonomous, independent, and master in its own house. It would be wrong, and contrary to the first principles of community development, for the Project to manipulate or patronise or indirectly control the neighbourhood council. If requested, the Project offers expert support. 1. Maintain and increase the ground swell of popular support for community activities generally, and the Neighbourhood Council in particular, so that there exists the necessary mass participation in decision making at the Ward level. 2. Develop slowly an individual series of �gtraining�h occasions that enable ordinary people in the Grove Ward to pick up their own understanding of the issues involved in community development and the necessary skills, in so far as they are relevant and germane to local needs. 3. Make maximum use of opportunity for discussion and consultation with elected members of Hammersmith Borough Council as regards actual policy and issues, especially as they impinge on day to day life in the Grove Ward, and the borough generally. 4. Help obtain and make financially secure the Welsh Presbyterian Chapel as an overall community centre for Grove Ward. 5. Be available as a resource at all times to ordinary people in Grove Ward who turn to the project for help or advice or to participate in what is going on. The end of �gthe First Report 1972-73�h quotes from a socio-economist: �gIt is the function of project teams to act as catalysts, critics, and innovators.�h The Hammersmith Community Development Project was a medium/catalyst to mediate between residents and local government, but the project did not directly involve the activities of the Grove Neighbourhood Council, and it aimed to remain as a rear support. The Hammersmith Community Development Project is a five year programme sponsored by the City Poverty Committee. During the first three years much of the activity has been concerned with the establishment of an elected Grove Neighbourhood Council and providing a resource centre at 26 Overstone Road. Tow previous reports give an account of this experience and there is general agreement in the Ward that the neighbourhood council is now able to make further progress without the support of the Project. We have seen the draft statement on Community Development in the Grove Ward (prepared by the neighbourhood council) and broadly endorse it. This will open up opportunities for the team at Overstone Road to develop its expertise in other parts of the Borough e.g. the White City or other critical areas in North Hammersmith. Widening the horizons of the Project is necessary if it is to make a success of community development. What is required at the next stage is a combined strategy on social policy and, if experience elsewhere is to be taken into account, great care will be needed in devising this strategy. Relevant action by central government is essential if local authorities are to succeed in combating poverty, homelessness, deprivation, racial discrimination, and inequality. These are problems of and for the whole of society but they can be tackled at the local level if boroughs will study patterns of need - inter relating [sic] housing, education, employment, [sic] community facilities, with the health, social services and planning departments. Fortunately we have managed to avoid the worst of these mistakes in Hammersmith (a) because of the cautious approach to community organisation over the last three years in the Grove Ward and (b) because of careful liaison with the Departments of the Borough Council. Involving local people in this process is fundamental and finding ways of making this happen has been a key role of the Project. Members of the Grove Neighbourhood Council stated that they were an organisation reflecting residents�f opinions at meetings. Therefore they were able to take an active part in the community as an organisation independent from the Hammersmith Community Development Project. Two weeks after this meeting, the Project decided to terminate its activities to support the Council. 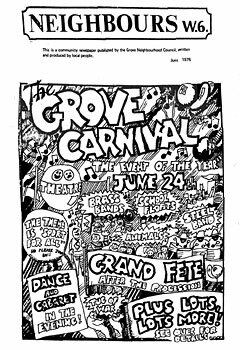 In March 1976, the Grove Neighbourhood Centre shifted its location to a prefabricated building on Bradmore Park Road. Afterwards, independent activities of the Grove Neighbourhood Centre were developed by local residents. 1 The first two years of the Hammersmith Community Development Project paid the research expenses and salaries by grants from City Parochial Foundation (75%) and Calouste Gulbenkian Foundation (25%). 3 This is a housing association established in 1963. It is a non-profit organisation to support housing for low-income groups, mediate public housing disposed of by the government, and improve old houses. 4 One of the eighteen constituencies had many voters therefore two Councillors were elected, but other constituencies had one each. Firstly, forty people filed their candidature but six of them were withdrawn, at the election thirty four candidates contested nineteen seats. Each Councillor had 240 to 344 voters, the voting rate was 5% to 35.6%, and 20% on average. �gThe First Report 1972-73,�h Appendix F.
5 It is different from the revised Council Constitution in 1995; terms such as �gcommunity spirit�h and �glocal community�h were not used in the first Constitution in 1973. 6 The Hammersmith Community Development Project Second Report, 1975, p.18. Several churches of different denominations in the neighbourhood offered space for the activities of the Hammersmith Community Development Project and the Grove Neighbourhood Centre. 7 The draft of the Hammersmith Community Development Project Evaluation and Assessment 1976 (owned by the Grove Neighbourhood Centre), p.5.